To my utter surprise I woke up on valentines day to this absolutely stunning hand made choker! Now doesn't it just make you feel the love? Vintage licks is a London based off beat vintage homemade brand. The necklace features a latch at the back which allows you to adjust it to any size, depending on your preference of how you like your chokers. I myself, like it tight as possible and it fit so perfectly! 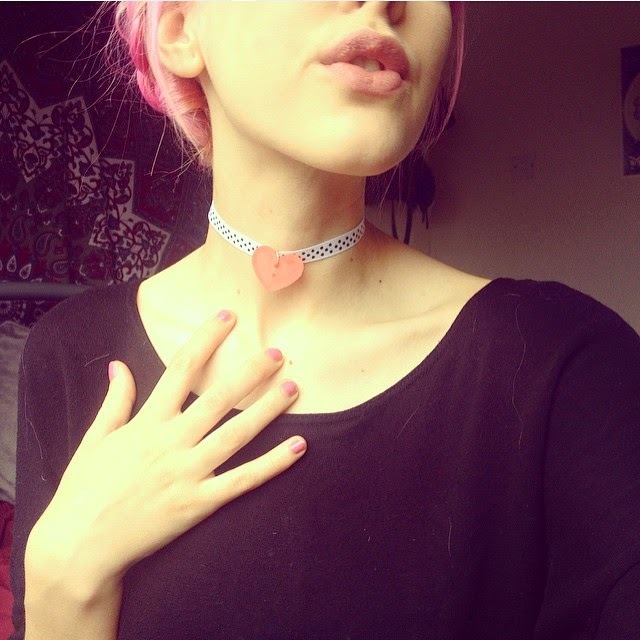 I also seem to have the problem with chokers that they don't sit where I want them to, especially with how small my neck is. The polka dot material is incredibly vintage styled which of course fits in with the name, so when looking further into the brand it was no surprise their clothing is vintage grunge. I love it. Sadly I had a hard eight hour shift at work so to brighten the spirits of all those lonely hearts I wore it to cheer everyone up! Thanks so much the guys over at Vintagelicks, I am going to wear this with everything to brighten up my looks.